Happy Monday! Today marks the start of a new week AND 8 days until Christmas. Woo! Most likely you have lots to do. Here is one more thing to add to your to-do list: Noodle-Less Eggplant Lasagna. It’s GLUTEN-FREE and VEGAN. With three fillings of deliciousness, this recipe requires some time. I promise it is so worth it. If you’re up to it, pre-make and assemble, then store in your fridge. That way when you get home from work or school, just plop it in the oven and bake for 30 minutes. This recipe is hearty, nutrient dense, and plant-based. For the first filling, I’d like to introduce you to tahini and balsamic vinegar. My two secret ingredients to make a rockin’ sauce. Combined with red lentils, tomatoes, garlic, onion, oregano, basil, and thyme, your taste buds will be DANCING. Health-wise, red lentils are full of protein, iron, and zinc. Whether you’re vegan or not, lentils are an affordable and staple legume I suggest keeping in your pantry. The next filling is my tofu ricotta. The similarity between it and the stuff made with dairy is uncanny. I should also mention, tofu further increases the protein content and adds calcium to this dish. Just make sure to read the label and choose calcium-set tofu made with calcium salts! To top it all off, I included red onion and peppers because growing up that’s how my mom always paired eggplant. I also couldn’t help myself because the color scheme gives off those Christmas vibes 💁. PLUS peppers contain vitamin C, which is an antioxidant. Antioxidants guard against free radical damage from things such as pollutants, UV light, radiation, etc. So as I stated before, this dinner is definitely nutritious and delicious! Start by drying out the eggplant. Preheat your oven to 375 degrees. Line 2 baking trays with parchment paper. Peel (optional) and cut 2 eggplants into ¼ inch rounds and place them so not overlapping each other. Bake for 25 minutes. For the Lentil Filling: Sauté the chopped yellow onion in water or olive oil. After 3-4 minutes the onions should look translucent. At this point add the minced garlic. Cook for another 2 minutes, then add crushed tomatoes, red lentils, tomato paste, oregano, basil, thyme, and water or vegetable broth. Bring the filling to a boil, then cover and simmer on a low heat for about 30 minutes. Stir in tahini, balsamic vinegar, salt and pepper to taste. If your tahini is towards the end of the jar, mix it with about 2-3 tbsp of water until you reach a smooth consistency. This way it will be easier to mix into the lentil filling. For the sautéed vegetables: Sauté the chopped onion in water or olive oil for about 3-4 minutes until translucent. Then add garlic, seasonings, red and green peppers. Sautee for another 6-8 minutes. For the tofu ricotta: Start by crumbling your tofu. Then simply add it, along with all the ingredients listed, to a food processor and pulse until thick and slightly chunky. Time to layer! Spread your choice of marinara sauce over the base of a large casserole dish. 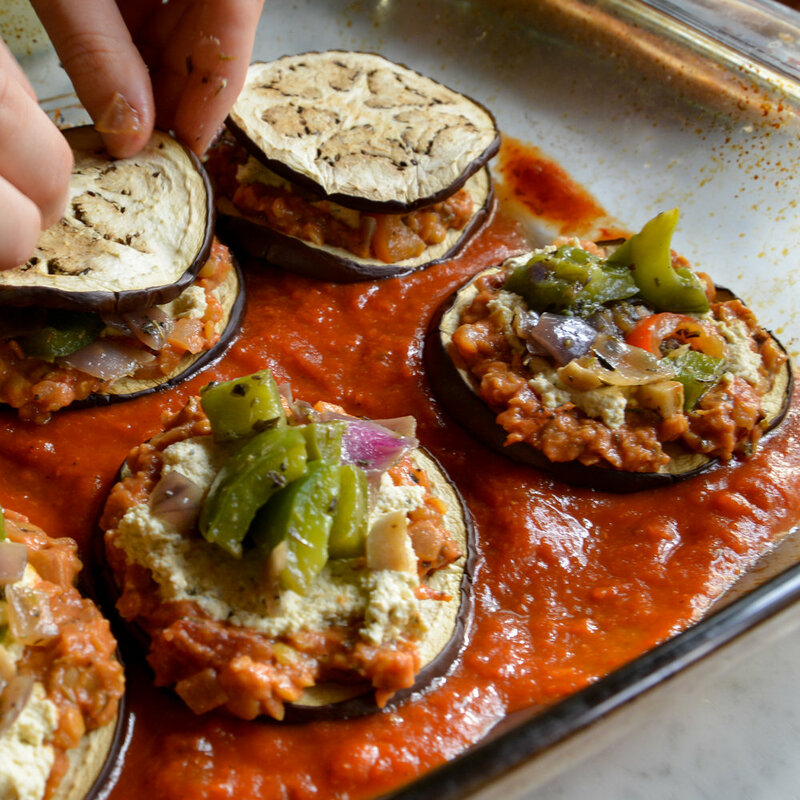 Place the eggplant rounds to cover the marinara sauce. My dish fit 6 rounds with some open area around the sides. Next, cover each round with the lentil filling, followed by tofu ricotta, and then sautéed veggies. Each filling should be about 1-2 tbsp worth. Repeat this process so you have three layers or use up your eggplant. Use excess lentils and veggies to fill in spaces around each stack. Cover the stacks with marinara sauce and swirl the remainder of ricotta on top. Place the casserole dish in the oven for 30-40 minutes at 375 degrees until the edges are bubbling. Let cool slightly and then serve with desired pasta or by itself!